Posted July 19th, 2012 by Hoffy Cycles. Here at Hoffy Cycles, we pride ourselves on knowing the ins and outs of every single element of a bicycle. It is this in depth knowledge that has allowed us to successfully run our award winning business in Brisbane since 1928. In the first of our new series of articles, today we will attempt to pass on some of our knowledge to our readers by helping to make sense of one of the most common issues seen in bicycles – flat tyres. If you have a slow leak in your tyre, don’t always assume the worst. Many times this can be a natural occurrence and is quite normal, especially when your bike is stored away for a long period of time. Remember to always keep your tyres at the correct pressure, and only take further action if the leak rate increases dramatically (e.g. goes flat after a few hours). Punctures are quiet a frustrating occurrence in tyres, as you may not know that your tyre has been punctured until you see it completely flat. Punctures commonly occur in bicycles when the rider passes over glass, nails or other sharp objects. These can generally be easily fixed with a patch kit. Pinch cuts occur when your bicycle clips the side of a curb or a large stone at speed. The sudden and forceful impact essentially violently ‘pinches’ the inner tube together, causing two splits in the tube. 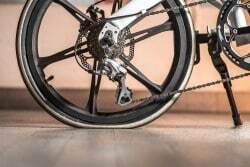 Blowouts are quiet frightening for any rider, as the inner tube of the tyre can essentially ‘pop’ for no apparent reason. The worst thing about this is that it often occurs while riding at speed, and it is not something that is able to be fixed. In today’s blog post, we have outlined the 4 main issues that can cause flat tyres in bicycles. In the next instalment of this series, we will continue the trend by explaining how to create a quick fix for many of these problems. If you would like to find out any more about anything we do here at Hoffy Cycles, please don’t hesitate to give our Brisbane store a call today on (07) 3269 1213.